Junkie XL (Tom Holkenborg), the founder of NERVE and part of a new breed of film composers that merges electronic with symphonic (“Divergent,” “300: Rise of an Empire”), found the perfect blend for George Miller’s “Mad Max: Fury Road.” Think rock opera meets “Vertigo.” It’s this high-octane, retro revitalization that has also landed him “Batman v Superman: Dawn of Justice” (he’s scoring the Dark Knight in contrast to Hans Zimmer’s Man of Steel) and the remake of Kathryn Bigelow’s iconic “Point Break” thriller. 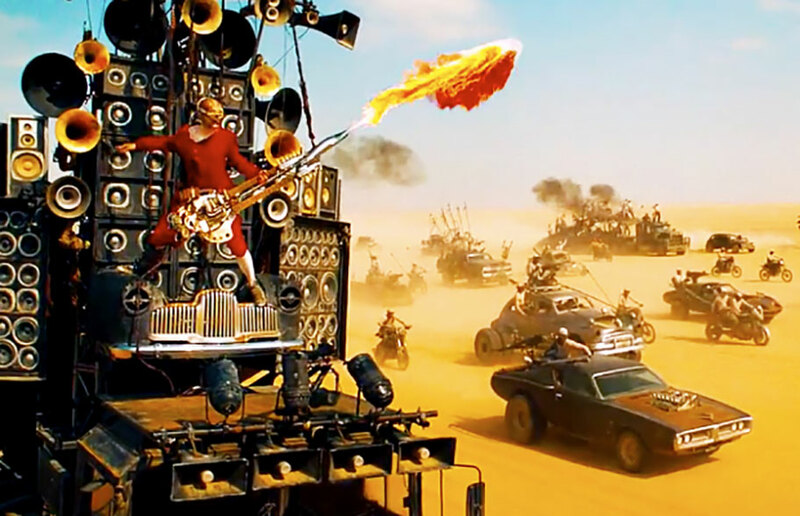 But for the most part, “Fury Road’s” vast landscape — the Outback from hell — provided Holkenborg the opportunity to utilize nearly 200 instruments and an 80-voice choir in a frenzy of beating drums, sweeping strings and growling electric guitars (pretty much anything he could get his hands on). “The idea with the rock element was that there is a big truck, almost like the Cavaliers for the Armada, with a bunch of drummers ramming away in the back and a guitar player in front, that follows the war party in the desert to hype them up as they chase Charlize Theron and Tom Hardy down with a bunch of girls in the [War Rig]. The guitar player is very scary, almost like Animal of The Muppets,” Holkenborg suggested. However, for the film’s second-half (the composer’s favorite part, actually), Holkenborg strips it all down with woodwinds and strings as the driving force in an homage to Bernard Herrmann’s “Vertigo” love theme (which itself was a new twist on Richard Wagner’s legendary “Tristan and Isolde”). “I think the highlight for me is that after all that madness the film comes to a halt and that’s where the music gets really small, really emotional…but they have such a hard time letting go of all the madness and the fear of being chased,” Holkenborg added. The hard part was pleasing Miller, who doesn’t like to be emotionally led by music or have the music get ahead of the narrative. “We did a lot of experimenting to find the right tone and to express love and affection. The thing about the scores of the ’50s is that they were pretty shameless about starting the love theme full on when a woman enters the room. That’s a different approach to what we do now in 2015 where we go at it slightly,” the composer offered. While Holkenborg won’t openly discuss “Dawn of Justice” (March 25, 2016), he has a hard time denying that the contrast between darkness (Batman) and light (Superman) makes for a great operatic-like fusion. Likewise, he’s also tight-lipped about DP/director Ericson Core’s extreme sports take on “Point Break” (opening Christmas), so all we can presume is that he going to new musical extremes for that one, too.